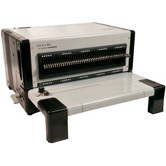 ADSS offers a wide variety of Wire binding machines for a sharp, professional look with double loop wire binding supplies. 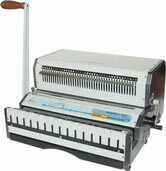 We stock a wire binding machine for all purposes. 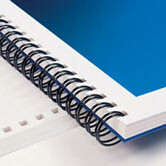 ADSS is your one-stop-shop for all your wire binding needs. 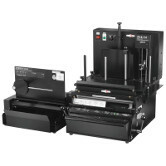 To assist you with your wire binding equipment needs, ADSS has made available a wire binding machine comparison table. This is a very handy list of the most important features of wire binding machines, including the punch capacity, maximum paper size, and weight of each machine. Contact our knowledgeable staff today for the widest selection, lowest prices and unsurpassed service on all types of binding machines and supplies: 800.808.2377. 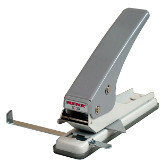 This TC 20 Thumb Cut Paper Punch is built strong and is easy to use. It is the perfect choice for small run punch jobs. It punches the 20mm thumb cut used for Calendars. The Dura Wire Manual Closer 450 is heavy duty and closes 3:1, 2:1, and 19 hole pitch wire. 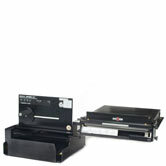 Open ends allow legal documents to be bound with the vertical wire closer, which makes it simple and quick. 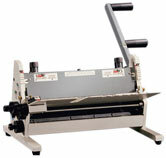 The Wire Pro 101 wire binding machine offers the professional look of wire binding for an affordable price. 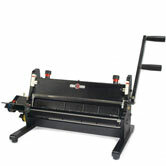 It punches up to 12 sheets of 20 lb paper and the integrated wire closer closes up to 9/16" wire. With its modern and compact design, the iWire punch and binding machine is the perfect all-in-one solution for any office environment. Wire bind easily and safely with your WirePro Advantage. Binds using 3:1 wire binding. A 2:1 model is also available. 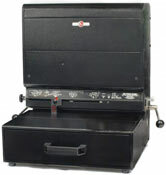 The WirePro Advantage Plus is a manual punch and bind machine. It is available in either a 3:1 or 2:1 wire punch pattern. 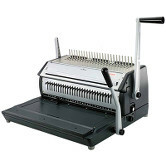 The WirePro 201 is a heavy duty 3:1 wire binding machine built to last. It can punch up to 20 sheets of 20 lb. paper. The WirePro 301 EPC (Electric Punch and Closer) comes equipped with features like a powerful electric wire punch and disengaging wire punch pins to make your wire book binding projects as efficient as possible. 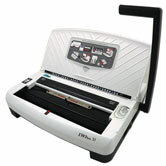 The WirePro 301 EPC Wire Binding Machine has a modern design complimenting any office and is collapsable to save space. The Akiles Flexicloser is the worlds first automatic wire closer with the Smart Detect System. The unique Smart Detect System allows the Flexicloser to automatically detect and close 3:1 or 2:1 wires with the simple push of a button. All-In-One manual wire punch (punches and closes 3:1 & 2:1 wire. 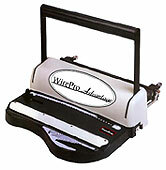 Heavy duty wire binding machine for creating professional bound documents and presentations. The Wirepro Advantage E has a heavy duty punch motor and manual closer built into one machine. 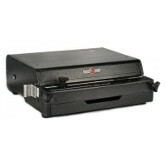 It can punch up to 20 sheets of paper (20 lbs.) and has a punch length of 14". 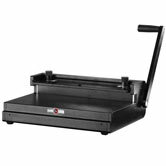 The Onyx HC8024 24" manual wire closing machine provides you with an affordable wire closer for binding up to 24" documents. Doing the job of machines that cost hundreds of dollars more, the 8024 offers fast, accurate wide application closing. It comes complete with an extendable table for the support of extra long documents. 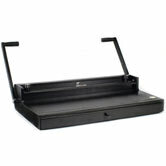 The James Burns Lhermite EB3500 electric wire closer is designed for binding documents up to 14" in length. 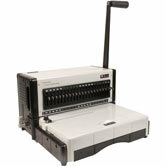 The EB3500 electric wire closer offers a tilted closing table and closing jaws to providing document positioning. 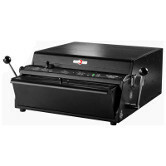 The Onyx ONYX HD8370 semi-automatic wire closing machine closes 3:1 pitch double loop wire in one easy step, eliminating manual insertion of wire into documents. The HD8370 is easily adjustable for varying sizes from 1/4 inch to 9/16 inch. The HD 8370 Insert-A-Bind inserts and closes wire into Documents. Use alone as a binding machine or add optional Mounting Brackets to use with your Rhin-O-Tuff OD 4000, OD4012, HD6500, HD7000, or HD7700 vertical punch and obtain maximum binding and punching throughput. The HD 8370 Wire Closer easily adjusts for wire binding sizes from 1/4" to 9/16". 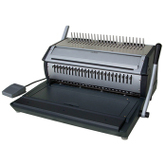 The Onyx HC-8318 semi-automatic wire closing machine is an 18 inch wire closer that binds calendars and other wide formatted documents. Documents with or without wire hangers can be bound into the book as the wire is closed! At last a small, affordable, easy to operate wire closing machine for short runs and yearly calendar applications. It binds documents up to 18 inches in length using 1/4" through 9/16" 3:1 pitch wire. 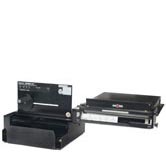 The ONYX HD 8370 Insert-A bind wire inserter/closer closes 3:1 pitch double loop wire in one easy step, eliminating manual insertion of wire into documents. The HD8370 is easily adjustable for varying sizes from ¼ inch to 9/16 inch (6mm-14mm). 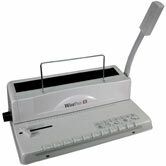 The ONYX HC-8318 is an 18 inch wire closer that binds calendars and other wide formatted documents. With or without wire hangers can be bound into the book as the wire is closed! At last a small, affordable, easy to operate wire closing machine for short runs and yearly calendar applications. 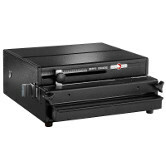 The ONYX HD8000 is a wire closing machine that offers a 14 inch (356 mm) legal size capacity and closes books from 3/16 inch to 1-1/4 inch thick (5 mm to 32 mm). The ONYX HC-8024 provides you with an affordable wire closer for binding up to 24" documents. Doing the job of machines that cost hundreds of dollars more the 8024 offers fast, accurate wide application closing. FlexiPunch-M is an innovative modular punching machine with manual operation and an affordable price that gives you the binding options you need in everyday work. 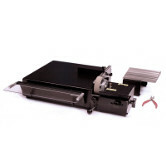 The FlexiPunch-E is a versatile, space saving, and money saving electric book binding machine which allows you to quickly and easily change out punch dies. The VersaBind-E electric punch with interchangeable "EZ Slide" dies punches and binds plastic coil, wire, and plastic comb bindings. It features an electric punch, electric coil inserter, a manual comb spreader, and a manual wire closer. The VersaBind-E electric punch with interchangeable "EZ Slide" dies punches and binds plastic coil, wire, and plastic comb bindings. It features an electric punch, a manual comb spreader, and a manual wire closer. The VersaBind-Ei electric punch with interchangeable "EZ Slide" dies punches and binds plastic coil, wire, and plastic comb bindings. It features an electric punch, electric coil inserter, a manual comb spreader, and a manual wire closer. The ONYX 4000PLUS is an 11 inch (A4) open-ended punch that features the EZ operator changeable dies. 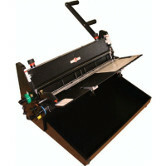 The ONYX 4000PLUS has a paper punching capacity of 20 sheets of 20 pound (80 gsm) bond. 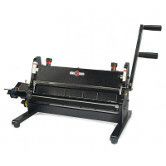 The Onyx OD4012 is a Heavy Duty 11 inch open-ended comb, wire, coil, and spiral punch machine. The Onyx OD4012 features the E-Z Change Punch Die System for changing punch patterns quickly. 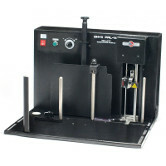 Heavy duty, 14 inch vertical load punch with interchangeable die system. Punches up to 35 sheets in 20 different hole patterns. 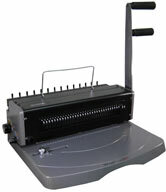 The ONYX HD7000 Comb, Wire, & Spiral Plastic Coil Punching Machine is a 14-inch (356 mm) open-ended spiral, comb, wire and coil punching machine that features the patented “quick change” die system for changing punch patterns in 30 seconds; no tools required and no bolts or screws to replace or misplace. 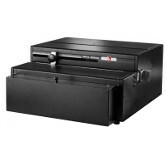 The HD7700 Ultima is the top of the line heavy duty durable Table Top Punch that has no equal. Combining the Rhin-O-Tuff patented Quick Change Die System. The Onyx HD7500 Horizontal is a 24-inch (610mm) open-ended comb, wire, spiral and coil punch machine for calendar and other applications. It features the patented “quick change” die system for changing punch patterns in 30 seconds. 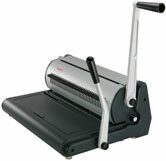 The PAL-M is a manual paper separator. 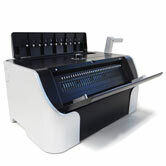 The PAL-M is used to optimize the amount of paper to be be inserted into the paper punch, not too much and not too little. 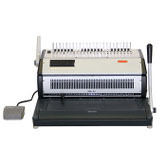 The PAL-14 is an automated electric paper separator. 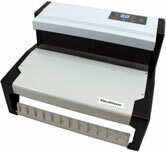 It optimizes the amount of paper being fed into your paper punch. 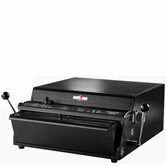 No more paper jams from too much paper or inefficient punches from too little paper. Make your HD Punch more productive by getting the APES-14! APES stands for Automatic Paper Ejector &Stacker module. With your Rhin-O-Tuff HD punch it will punch, eject and stack in one operation. Make your HD Punch more productive by getting the APES-14-77! APES stands for Automatic Paper Ejector & Stacker module. With your HD punch it will punch, eject and stack in one operation. Mid volume electric tabletop wire-o finisher with featrues like a heavy duty electric punch, wire-o inserter, and wire-o closer in a compact tabletop unit. 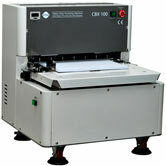 The CBX 100 Automatic Punching Machine can punch up to 100 sheets at one time (20 lb. Round Hole). It can be easily changed to punch documents in patterns for Coil, Wire, Comb and many more. Multi—­purpose binding station. 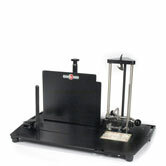 Use to provide a mounting platform for the OD4300 coil inserter, OD4200 wire crimper or OD4300 comb spreader.